During the past fifty years I have made many trips to Northern Ireland, as this is where my wife was born and where some of her family still live. It is a beautiful country, but even more interesting beneath the surface. 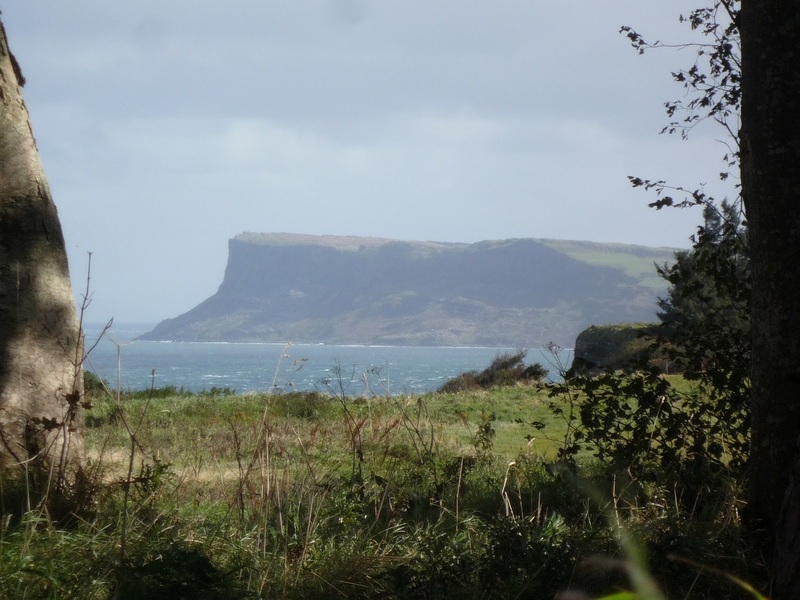 The north-eastern corner, Country Antrim, is particularly interesting and the geology is readily visible along its coast. 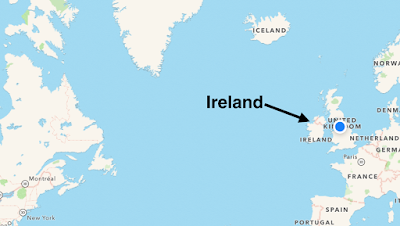 Until relatively recent times (65 million years ago) there was no Atlantic Ocean and the land structure of Ireland was in continuity with North America. Geological time seems to have started with the supercontinent Rodinia, which was assembled about one billion years ago (the age of the Earth is 4.5 billion years). With continental drift, Rodinia split into two with the formation of Laurentia (which gave rise to the north hemisphere land masses) and Godwana (which gave rise mainly to the southern hemisphere land masses). The gap between the two became the Lapetus Ocean, about 480 million years ago. Then there was a reversal. 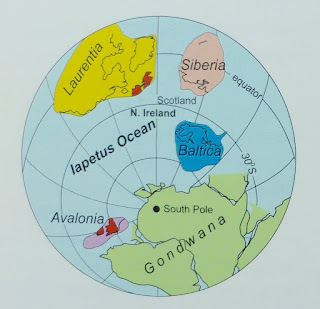 Lautentia and Godwana started to move back together to form the super-continent Pangea, about 400 million years ago. The Lapetus Ocean disappeared completely about 250 million years ago, but a remnant of its seabed is found in Ireland. The collision of Laurentia and Godwana resulted in the elevation of the Great Caledonian Mountain Range. 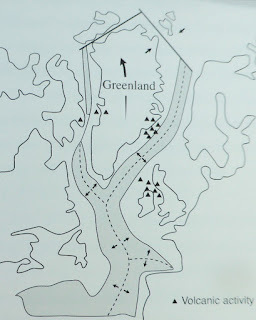 Today its fragmented remains can be found in Norway, Scotland, the north of Ireland, Newfoundland and further west in Canada. 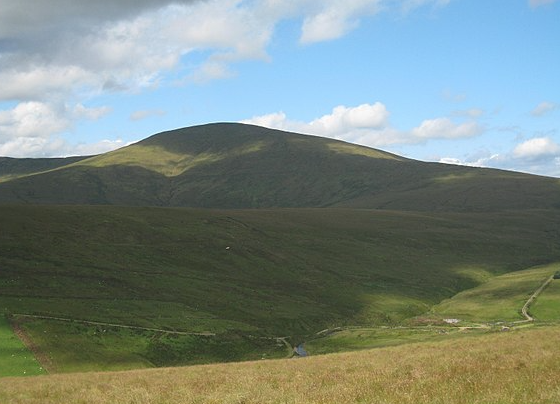 The Caledonian Mountain range is represented in Ireland by the Sperrin Mountains in County Londonderry. Being mountains of such antiquity, gathering has caused them be much reduced in height and rounded. Further continental drift lead to the break-up of Pangea, about 65 million years ago. The separation of the North America tectonic plate from that of Europe led to the creation of the Atlantic Ocean and the continental arrangement that we see today. 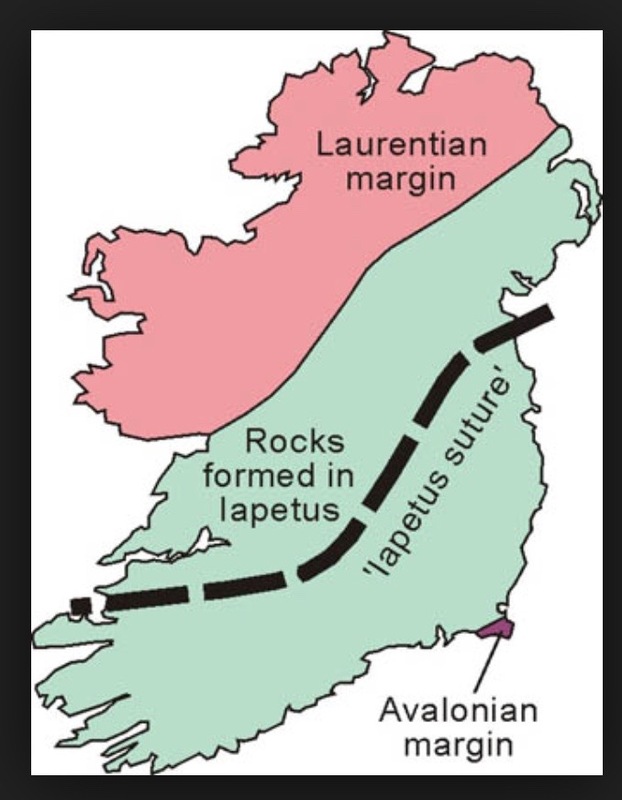 One geological feature of Ireland is that the northern part is derived from Laurentia whereas the southern part originated in Godwana and the Lapetus Ocean bed. 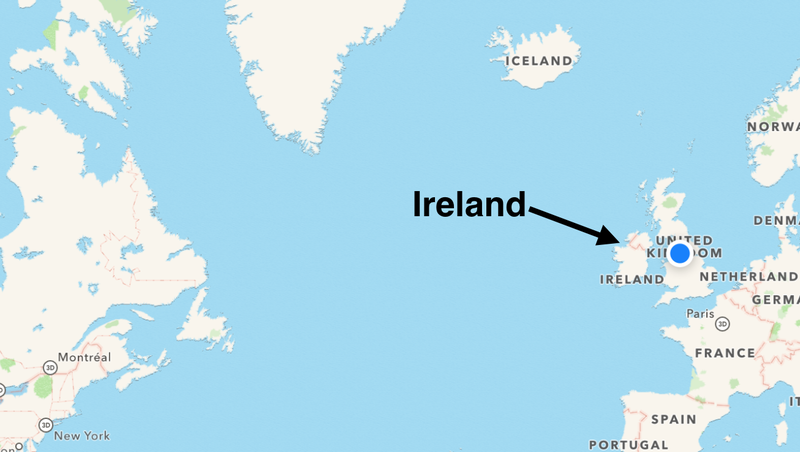 There was time when the island of Ireland was submerged beneath a warm tropical sea. 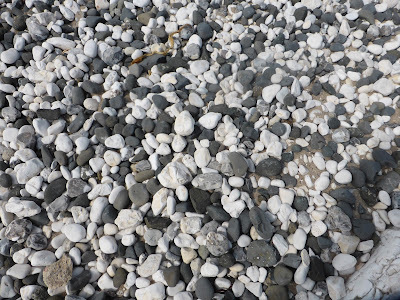 This led to a thick limestone layer, derived from the deposit of vast numbers of minute calcium-containing sea creatures. The land level rose again (or the sea level fell) so that the surface of the land became limestone, chalk of the cretaceous period. 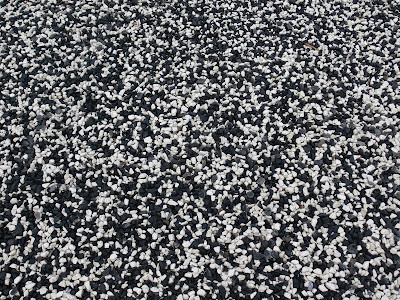 The limestone surface allowed the appearance of luxurious plant life. This was on the super-continent Pangea, before the opening of the Atlantic Ocean. 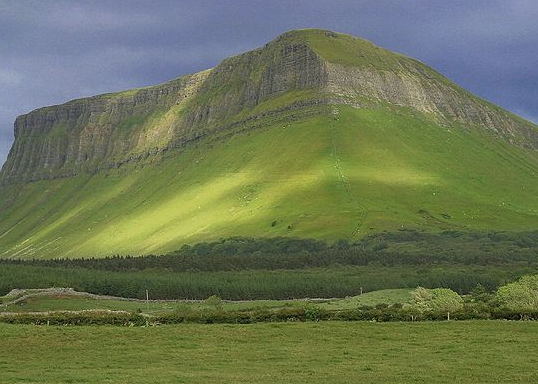 After the elevation of the limestone landmass of Ireland (and much of the British Isles), there was a long stable period of almost 200 million years. 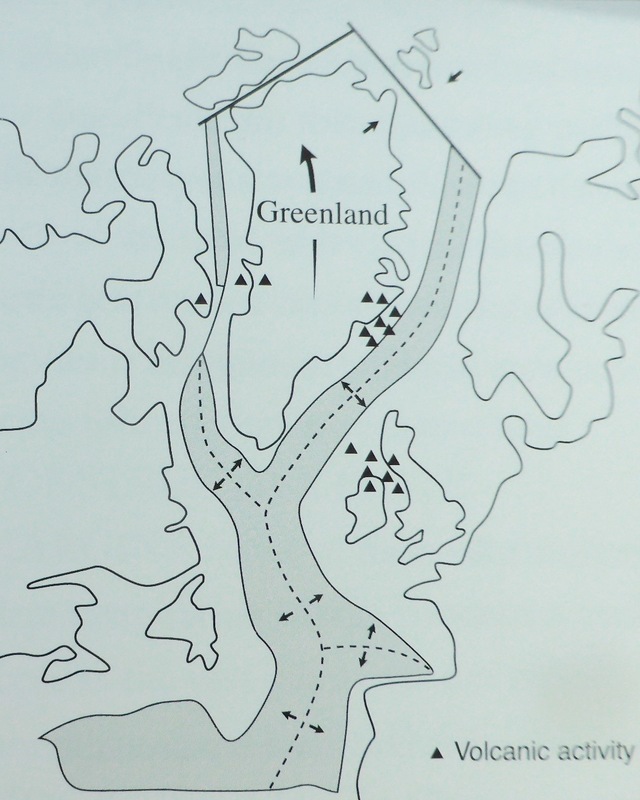 Movement of the North American tectonic plate away from Europe brought this to an end. We are aware of the mid-Atlantic ridge as an indication of the volcanic activity of tectonic separation, extending into the volcanic island of Iceland. 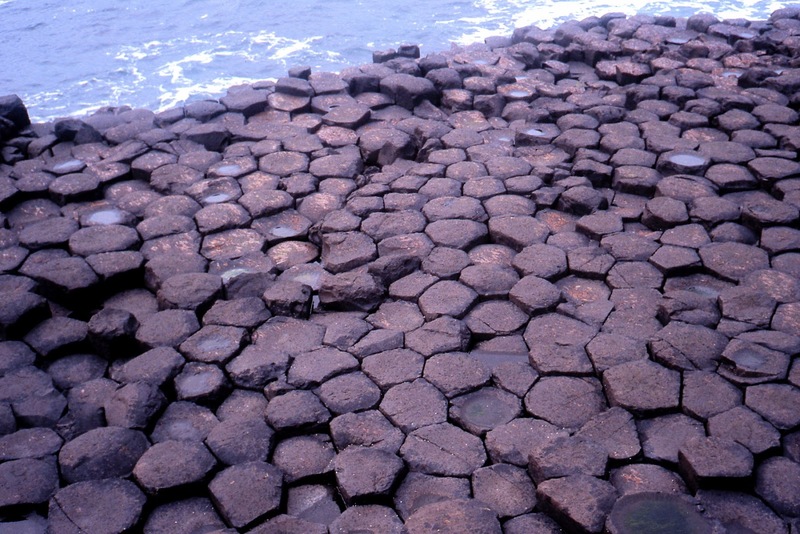 However this process started in Ireland, and evidence of this volcanic activity can be seen in County Antrim. It is seen today as an active process in Iceland. 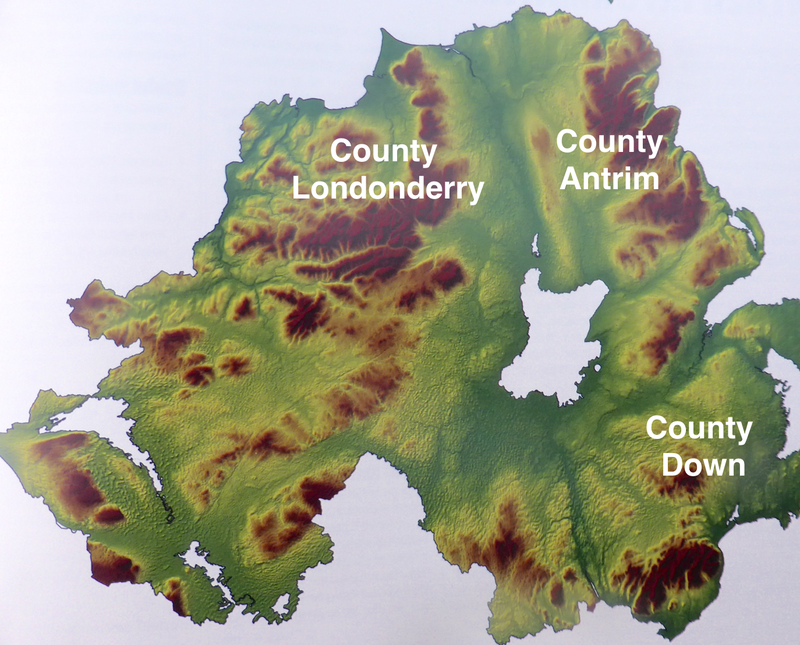 Country Antrim is a large lava plateau that has covered the limestone (chalk). The first major lava flows over the limestone came to an end, then followed by sufficient stability to allow plant life to reappear. But then there was a second series of major lava flow, giving rise to the basalt formations of the magnificent Giant's Causeway. 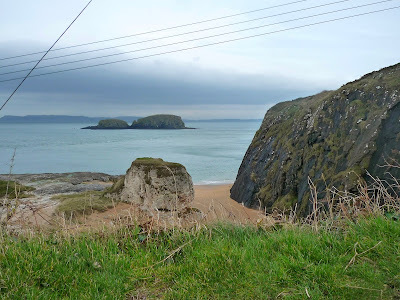 Major geological activity then came to an end as the line of separation of the North American and Euro-Asian plates moved away from Ireland into the new Atlantic Ocean. 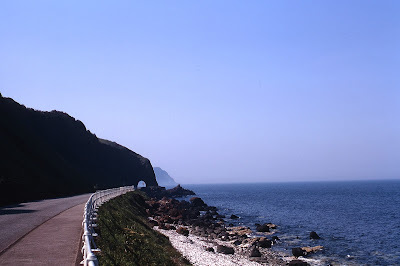 The story of these geological processes are readily visible on driving along the Antrim coast road, which was first constructed in 1830. 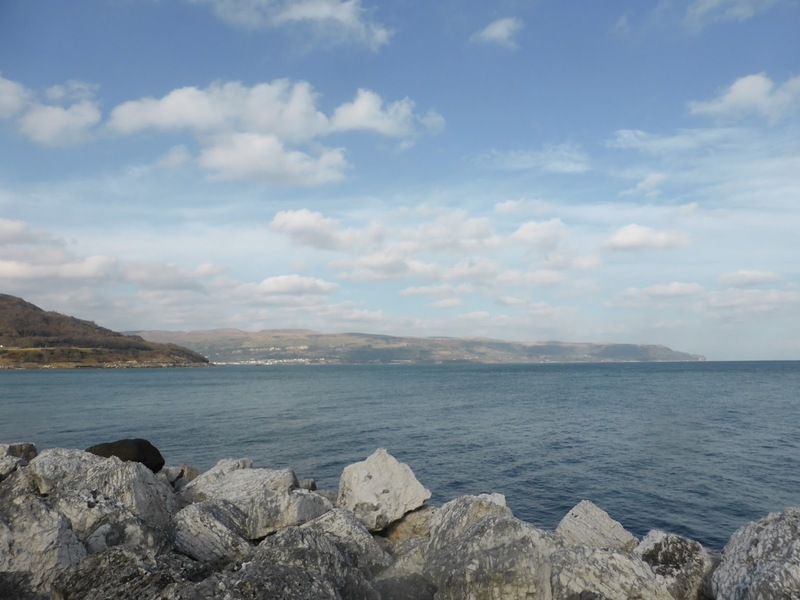 There has been additional geological activity with the occurrence of faults in the land surface. 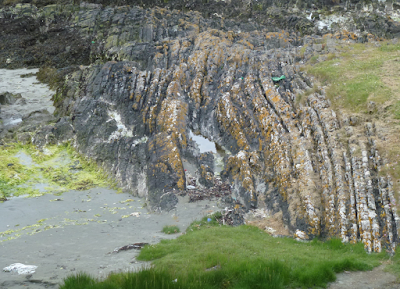 These have allowed the basalts and chalk to become adjacent, when sections of basalt slipped down to the level of the chalk. 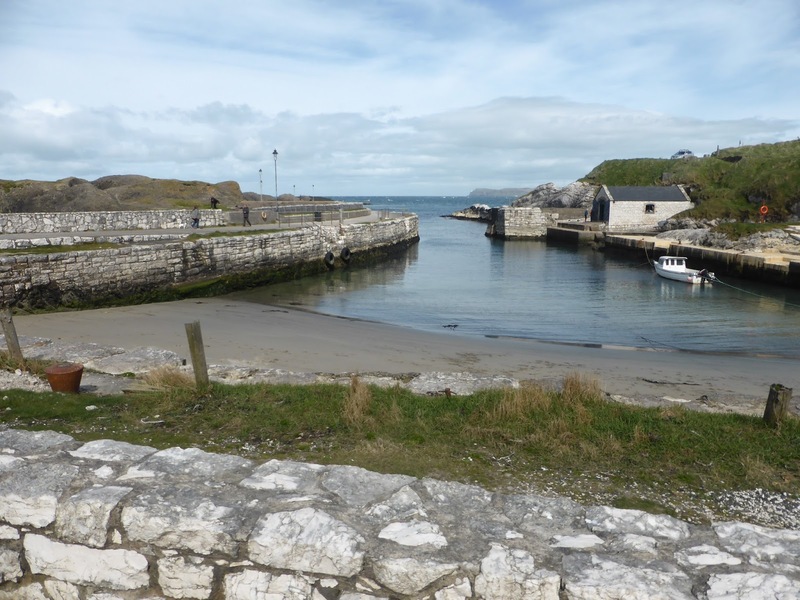 Fault-lines can be seen well in Whitepark Bay and also at the picturesque and geologically fascinating natural Ballintoy harbour. 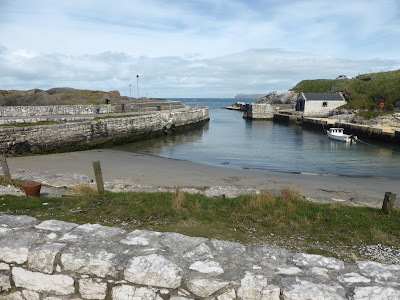 One side of the harbour (north, on the left of the photograph) is basalt and the other side (south) is limestone. The action of the sea has resulted in a mixture of black (basalt) and white (chalk/limestone) pebbles. 17. 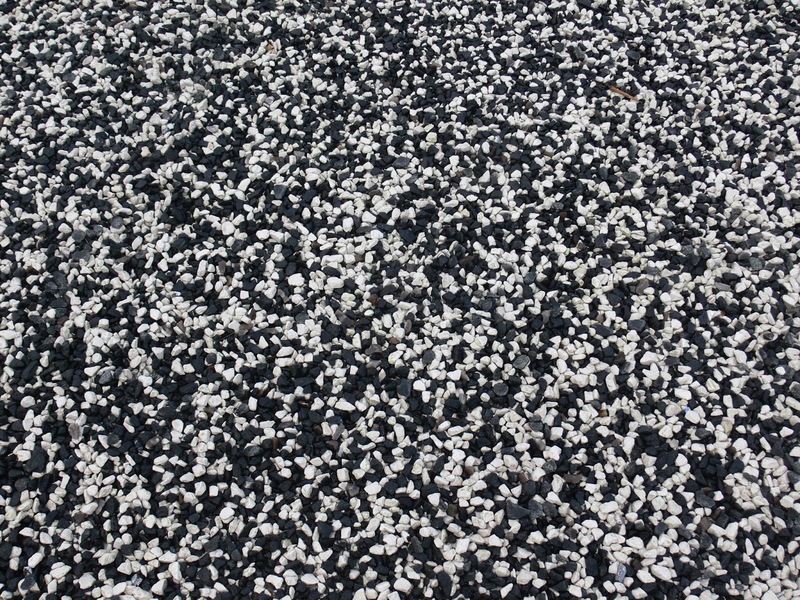 "Salt and pepper sand"
Further sea action has resulted in remarkable and perhaps unique "salt and pepper sand". 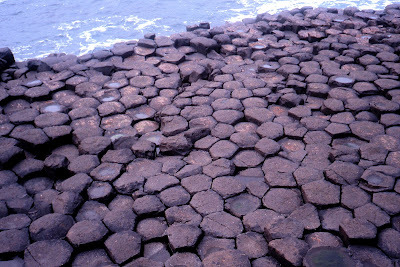 There other geological features in Northern Ireland. To the south of Country Antrim lies Country Down. On the coast of County Down, on the Ards Peninsula, folded mudstone rocks of the bed of the original Lapetus Ocean can be seen. But the most important geological feature of County Down must be the Mountains of Mourne. These are granite, which after spending millions of years beneath the surface being heated and becoming crystalline, were pushed up to a great height. 20. 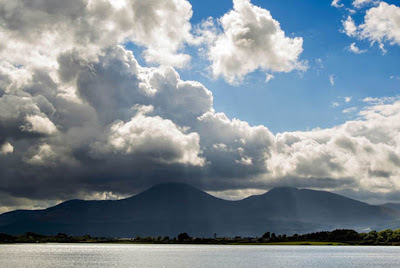 "Where the Mountains of Mourne sweep down to the sea"
At present the Mountains of Mourne rise to an elevation of just under one kilometre, but it is calculated that the maximum elevation in the distant past was four kilometres. The erosion of the high mountains by the weather has resulted in a profusion of large rounded granite boulders. 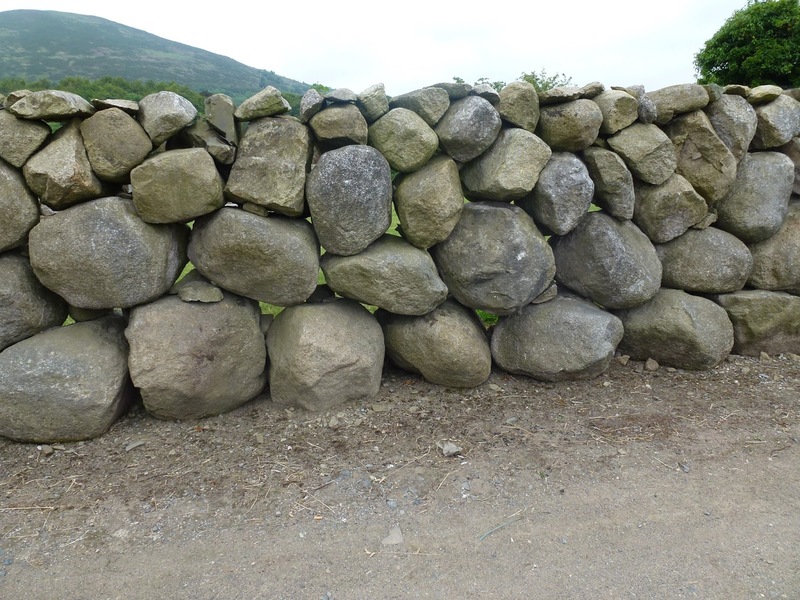 It must have been with difficulty and considerable skill that the fields of County Down became characterised by perimeter walls of Mourne granite stones. 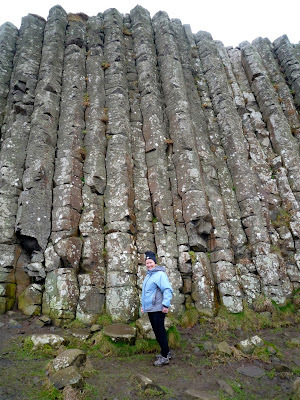 Ireland in general, and Northern Ireland in particular, is remarkable for its geological interest. 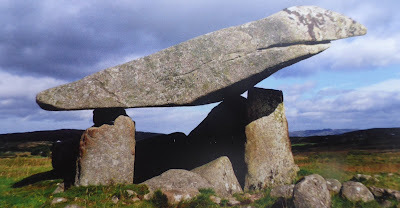 It is also possible to see many examples the use of stone by humankind during the past six thousand years. What a beautiful place. I always enjoy a landscape more if I have some appreciation of it's geology. I imagine geology would have been your second choice of career. Congratulations on going 'off piste' from your usual subject! It certainly wasn't the geography master at Stand Grammar that inspired you David, but it's clear you could have had another career! Well done.